HIGH CHAPARRAL (IRE) (Bay 1999-Stud 2004). 10 wins-2 at 2, The Derby, Gr.1. Champion Aust. Sire (AEI) twice. Sire of 1364 rnrs, 822 wnrs, 82 SW, inc. So You Think (MVRC WS Cox P., Gr.1), Dundeel, Shoot Out, Monaco Consul, Contributer, Toronado, Wigmore Hall, Lucky Lion, Free Eagle, Descarado, Redwood, Fenway, High Jinx, Pondarosa Miss, Wrote, Joanna, Western Hymn, Frine, Enaad, Alpine Eagle, Elektrum, Forever Loved, Show the World, etc. WINNER TAKE ALL, by Arena. 6 wins to 1550m, A$172,910, ATC Randwick Convention Centre H., Alexandria H., Free Entry Today H., WN Bull Funerals H., 2d ATC Always Recycling H., Rose Bay H., 3d AJC Queen's Park 2YO H., Blair Athol H., Paddington H., Watsons Bay H., Panorama Dining Room H. Three-quarter-sister to REGAL CHEER (dam of KNOYDART). Dam of one named foal. Winner Take All. 6 wins. See above. One More Roll. 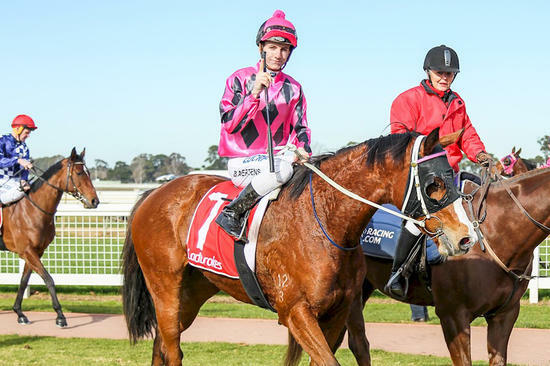 2 wins at 1000m, 1400m in Aust. Forest Gazelle. Winner at 1000m in 2015-16 in Aust. Uncanny. Winner at 1200m in 2015-16 in Aust. Gatto Mondo. 2 wins at 1200m, 1600m to 2015-16 in Aust. KNOYDART (More Than Ready). 5 wins to 1300m, A$742,180, ATC Canterbury Classic, L, MRC (Mornington) Hareeba S., L, ATC TAB Rewards H., Turf Club H., Tab.com.au H., 2d BRC BTC Cup, Gr.1, ATC Hall Mark S., Gr.3-twice, 3d VRC Newmarket H., Gr.1, MRC Oakleigh P., Gr.1, VRC Gilgai S., Gr.2, ATC City Tattersalls 2YO P., 4th BRC Doomben Ten Thousand S., Gr.1, ATC Challenge S., Gr.2, MRC Autumn S., Gr.2, GCTC Victory S., Gr.2-twice. Precautions. 2 wins-1 at 2-at 1100m, 1250m to 2016-17, ATC Tab.com.au H.
Frammenti. 3 wins at 1000m, 1100m, 3d MVRC Buy Your Racing Calendar Now H., 4th MRC Blue Diamond Preview (c&g), Gr.3. Dixie Melody - Peace n Prosperity (H.K.). 4 wins at 1200m, A$12,625, HK$2,853,925, to 2015-16 in Aust. and HK, HKJC Hong Kong Exchanges Challenge Cup, Fung Mo H., Japan Racing Association Trophy H., 2d HKJC Deep Water Bay H., Hoi Lai H., 3d HKJC Poplar H.
Splendid Retreat (Splendent). 8 wins-1 at 2-from 1400m to 2000m, A$247,725, AJC Orchard Tavern Welter H., NSW Tatt's RC Pontac Finance Welter H., AJC Honda Legend Welter H., William H Ogilvie 2YO H., Pretti Real Estate H., STC Thrifty Car Rental H., 3d STC Kingston Town S., Gr.3, Canberra Cup, L.
Clochemerle. 6 wins-3 at 2-to 1200m, A$122,500, AJC Balmoral 2YO H., QTC Regal Advice H., STC Parramatta Foundation 2YO H., Cameo 2YO H., 3d AJC Ma Cherie 2YO H., STC Sir Ivor 2YO H.
MY LADY'S CHAMBER (Arena). 2 wins-1 at 2-at 1200m, 1400m, A$327,800, Canberra RC National Sprint H., L, STC Special K 2YO H., 2d AJC Flight S., Gr.1, City Tatt's RC Furious S., Gr.2, BTC Doomben Roses P., Gr.3, STC Epona S., L, 3d STC Tea Rose S., Gr.2. Producer.